The inspiration for the hit Fox series Bones, Kathy Reichs explores another high-stakes crime from today's headlines-in a case that lands forensic anthropologist Tempe Brennan in the middle of a gruesome international scheme. I too could not get past the first disc....definitely not a good narrator for this writer. Perhaps Ms Reichs needs a BREAK of her own! I barely made it through the first disc - it was plodding, the narrator was flat, and there really wasn't anything to keep me interested enough to try the second disc. Not enough suspense, not enough character, not even a very interesting discovery was established early enough in the book. Total pass on this one. This book was good, just not as good as some of the author's others. It tended to be slow and drag on in the middle chapters. There were also so many characters added in throughout and some of them didn't seem necessary. 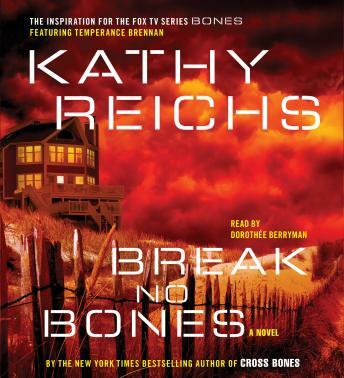 A friend loaned me two of Kathy Reichs books which I read and really enjoyed. However, Break No Bones didn't hold my interest as well. It was difficult to keep up with the characters. Perhaps it was because she didn't seem to spend as much time examining the evidence as in looking for other clues outside the coroner's realm. I really liked the book. I've read several books by Kathy Reichs and have enjoyed each one. I really like the TV show. I found the book to be very slow. Its like the Doctor didn't have much of a personality, unlike the Doctor on the TV show.